You are entitled to construct a Garden Room up to a maximum size of 25 square meters (270 Sq ft) internally provided you leave 25 square meters of free space in your Garden. If you are planning a house extension down the line it is important that you leave the 25 square meters free area after both the Garden Room and house extension are completed. The 25 sq m free space can be made up of the side and the rear of the property. You may construct a mono pitch or single pitch roof up to 3m in height or you may construct up to 4m in height for a slated or tiled pitched roof. You are not permitted to place a window within 1m of a neighbour’s boundary. Garden Rooms can be used to enhance the family lifestyle. They can be used as an over flow to the family home ideally for a Home Office, Teenager Rooms, Art Studio, Hobby Room, Games Room, Home Study etc. Note: These building are not permitted to be lived in or to be used for sleeping accommodation. This is important if emergency services need to attend a call out and are not aware that a habitable structure is in the rear of your property. You can construct a Garden Room to the side or the rear of your property. If you are planning to construct the Garden Room to the side of the property, you must either screen the building with bushes, trees or fencing, or you must match the façade of the existing building, to meet the exemption criteria. Please keep in mind existing timber or block sheds may take up some of your 25 square metre exemption. If, however, you have a garage or shed that was included in the original planning permission granted when your house was built, you will still be entitled to the exemption of the 25 square metre for your new Garden Room. 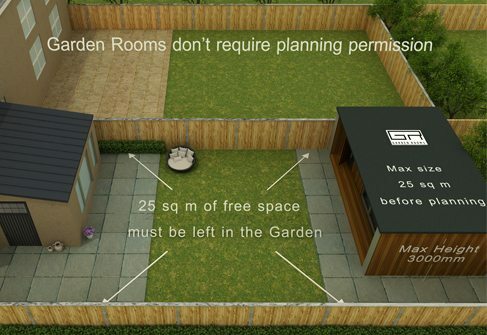 Whilst your building is exempt under 25 square meters, we do advise you to inform your neighbours of your proposed Garden Room. The intention here is not to seek permission from them, but rather to inform them out of courtesy. Note: Above is our understanding of the planning exemptions for a Garden Room in Ireland, GardenRooms.ie only build with in the permitted planning exemptions. Ultimately it is the responsibility of the home owner to be aware of the planning exemption and we would recommend that you familiarise yourself with the exemption rules or contact your local planning authority if you feel you are not exempt. For more information check out the Development and Planning Guidelines. We are also happy to guide you as best we can.